Matthew Arnold & Baldwin’s existing website had been developed nearly a decade previously when legal websites tended to be online versions of the firm’s brochure. Their site had become difficult for users to navigate: information was not linked together and was difficult to find. The firm felt that the site was dated and did not reflect their wish to be a progressive firm or offer their clients access to an up-to-date user experience. Also, it did not allow them to interact effectively with their clients and other lawyers, inside and outside of the firewall, or externally portray the wealth of knowledge vested in the firm’s partners, fee earners and support staff. The new MAB website’s guiding principles were thought leadership, conversation and easy access to information. Headshift created the new site by using an open source blogging platform – WordPress. The new site enabled MAB’s lawyers to blog and share their thoughts on professional matters with other lawyers and clients, easily and with little training. The same software platform also acted as a content management system so that the firm could maintain a hierarchy of pages with relevant information without having to call on Headshift when content was published or changed. We incorporated other social functions to improve and enhance the user experience – this included RSS feeds, subscriptions, tags and tag clouds. The site has helped to increase MAB’s online marketing presence and has helped established the firm as thought leaders. 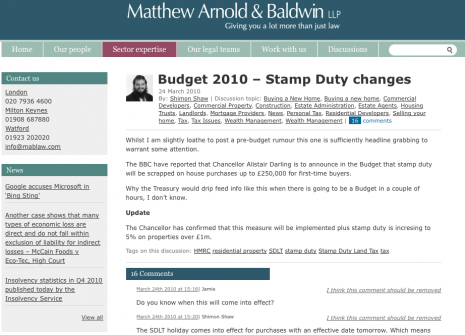 For example, the firm were the among the first to communicate the changes to property stamp duty in 2010 via their blogs. This generated a lot of comments, discussion and interest in the firm and resulted in the site being in the top web search results for stamp duty.